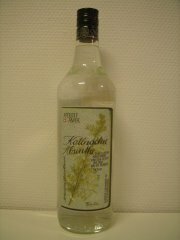 Since the absinthe ban was completely revoked in Switzerland in January 2005, many traditional Suisse La Bleues have seen the legal light of day. The Kallnacher is one of them. This particular bottle was obtained through Absinthevertrieb.de just as the Clandestine. With the many La Bleues popping up these days it's quite hard to tell them apart. Many are made using similar recipes and many probably with the same sources for herbs. The Kallnacher does of course resemble the others a lot but it does have a little something that differs. The aroma isn't the fennel heavy as many others tend to be. There's a slight more noticable hint of wormwood in it which at first seems very nice. Pouring it in the glass reveals more of the drinks character and though it's still very promising, there's a slight funk which shouldn't be there. Adding water to it does remove that funk from the aroma but it's still slightly present in taste. The taste is otherwise quite appealing and it actually does differ from many other La Bleues. Good or bad, that's up to each and everyone to decide for themselves, but I enjoy it not being just another one in the crowd. The funk needs to be dealt with, most definitely but it's nothing that ruins the drink as it is and I do recommend the Kallnacher since it's a very nice drink never the less.